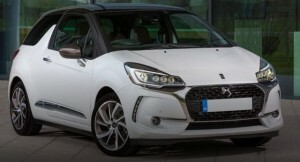 The new for 2016 DS3 is a facelift upgrade to the stylish three door supermini that burst onto the scene in 2009, the DS stands for Different Spirit and is now a stand alone brand within the Citroen stable. The most noticeable updates are at the front, where a DS-badged hexagonal grille replaces the old Citroen ‘double chevron’ design. Higher-spec models get smarter headlights that combine LED’s and xenons. At the back, it’s a case of subtly reprofiled lights. The DS3 drives extremely well as you would expect from a car that is low to the ground, front wheel driven and light in weight, it is sure footed and reacts well to being driven hard, in short it goes as well as it looks. Whichever of the five trim levels you choose from, Chic, Elegance, Performance Line, Prestige and Ultra Prestige all models come with air-conditioning, cruise control, alloy wheels and a seven-inch touchscreen infotainment system. Elegance models get tinted rear windows, 16-inch alloy wheels and LED front fog lights, sports seats, and rear parking sensors. Performance Line add 17 inch alloy wheels, black roof, rear spoiler, sat nav and red stitching to carpets and seats. Prestige models get a sat-nav, automatic lights and wipers, front parking sensors and an upgraded stereo, part-Alcantara leather seats, 17-inch alloy wheels and automatic emergency braking. Ultra Prestige models get a DS monogram on the roof and laser-etched wing mirrors, “watch strap” leather upholstery and a centre armrest. The 1.2 litre 128bhp PureTech makes for a nippy performer, 0-62 mph in just 8.9 seconds, but it’s the healthy 170Ib ft torque that most people will notice in everyday use as it arrives from just 1,750rpm (low down in the engine’s operating speed) so there’s no need to constantly change gear pushing the claimed fuel economy to a very impressive 62.8mpg. The 128 petrol is our pick but the 1.6 litre 120 bhp diesel can reach 62 mph in 9 seconds and return nearly 90 miles per gallon. Automatic option is only on the petrol as a detuned 108bhp engine paired to a 6 speed EAT gearbox. 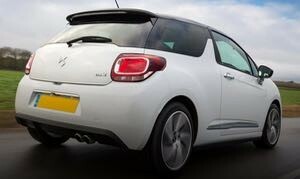 The DS3 is being replaced with a 5 door DS3 Crossback, more of a mini SUV. This is the last quarter the car will be avaialble and there are only two models and they are expensive considering it is a car due to be replaced.